According to a new market report published by Transparency Market Research titled “Mobile Payment Technologies Market – Global Industry Analysis, Size, Share, Growth, Trends, and Forecast, 2018–2026”, the global mobile payment technologies market is expected to reach US$ 50,561.64 Mn by 2026, expanding at a CAGR of 37.8% from 2018 to 2026. Asia Pacific held a prominent share of the mobile payment technologies market in 2017 and is projected to be at the forefront of global demand, and the market in the region is expected to expand at a significant CAGR among all regions. Mobile payment is a concept wherein a portable electronic device such as a smartphone, tablet, or cell phone is operated as a payment medium. Mobile payment technology allows consumers to make immediate payments for products and services. Growing adoption of advanced technologies such as near field communication (NFC), wearable devices, and mobile point-of-sale (m-POS) are expected to lift the demand for mobile payment technologies in the forthcoming years. The idea of using mobile payment technologies derives from avoiding the usage of currency, coins, plastic, and paper media such as checks, cash, bank transactions, and debit/credit cards. Currently, the mobile payment technologies market is expanding at a higher rate due to the increasing adoption of smartphones and tablets across emerging economies. The mobile payment technologies market can be segmented based on type, purchase type, end-use applications,end-user, and geography. Based on type, the mobile payment technologies market has been segmented into proximity payment and remote payment. The growth of the remote payment segment is due to increasing adoption of mobile wallets by consumers for payment purposes at the retailers or for e-commerce. Proximity payment technology market is further segmented into near field communication (NFC) and QR code payments. Based onpurchase type,the mobile payment technologies market has been divided intoairtime transfers & top-ups, money transfers & payments, merchandise & coupons, travel & ticketing and others. In terms of end-user, the mobile payment technologies market has been divided into hospitality and tourism sector, BFSI, media and entertainment, retail sector, healthcare, education, IT & Telecommunication, and others. Based on geography, the global mobile payment technologies market has been divided into North America, South America, Europe, Asia Pacific, and Middle East & Africa. Asia Pacific is expected to hold a prominent share and account for more than 50% of the global market in 2026, followed by North America. The growing adoption of smart appliances such as smartphones is a major driving factor for the strong growth of the mobile payment technologies market in Asia Pacific. Asia Pacific is one of the most populous regions in the world and its banking and financial segment is comparatively undersized. Also, the majority of adults having no direct access to official financial organizations across the region is expected to provide huge opportunities for mobile payment service providers in the coming years. Moreover, the rise in advance payment solution offerings by technology providers has led to the increasing adoption of ground-breaking mobile payment technologies across the region. As a part of the strategy, several service providers are investing in tools development specific to a particular application and are focused on new product developments, partnerships, and mergers and acquisitions in order to increase geographical reach in the global mobile payment technologies market. Major players operating in the global mobile payment technologies market include MasterCard International Inc., Visa, Inc., American Express, Co., Boku, Inc., Fortumo, PayPal, Inc., Bharti Airtel Ltd., Vodafone Ltd., AT & T, Inc., Google, Inc., Apple, Inc.,Tencent,Ant Financial Services Group, and Microsoft Corporation. The report on the global mobile payment technologies market provides analysis for the period between 2016 and 2026, wherein 2016 is the base year, and 2018 to 2026 is the forecast period. Data for 2016 has been included to provide historical information. The study provides a comprehensive analysis of the expansion of the market during the forecast period, in terms of revenue estimates (in US$ Bn), across different geographies. 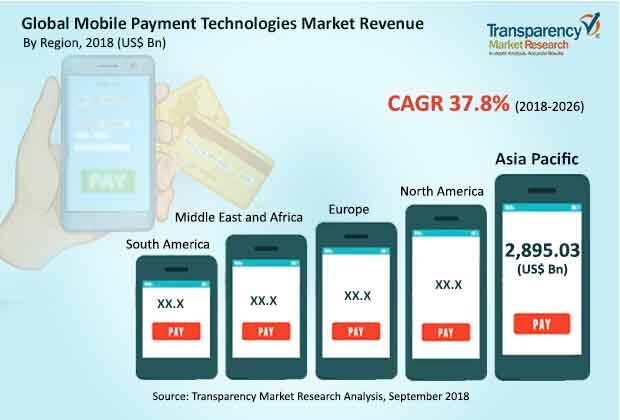 The report covers market dynamics including drivers, restraints, opportunities, and trends expected to influence the expansion of the global mobile payment technologies marketduring the said period. Technologies that are playing a major role in driving the global mobile payment technologies market have also been considered in the study. The report also coverskey industry developments, Porter’s Five Force analysis which identifies bargaining power of suppliers, bargaining power of buyers, threat from new entrants, threat from substitutes, and degree of competition in the mobile payment technologiesmarket. Ecosystem analysis which identifies key stake holders in the mobile payment technologiesmarket is covered in the report. The mobile payment technologies markethas been segmented based ontype, purchase type, and end-use application. By type, the market is segmented into proximity payment and remote payment. The market for proximity payment technology is further cross-segmented into near field communication (NFC) and QR code payments. The remote payment technology market is segmented into SMS-based, USSD/STK, direct operator billing (credit/debit cards), and digital wallets. On the basis of purchase type, the mobile payment technologies market is segmented into money transfers & payments, travel & ticketing, airtime transfers & top-ups, merchandise & coupons, and others. Further, the end-use application segmentation includes hospitality and tourism, BFSI, media and entertainment, retail, health care, IT and telecommunication, education and others.Geographically, the report classifies the global mobile payment technologies marketinto North America, Europe, Asia Pacific (APAC), Middle East & Africa (MEA), and South America; the regions are analyzed in terms of revenue generation. Furthermore, region-wise prominent countries covered in the report include the U.S, Canada, U.K., Germany, France, Japan, China, India, GCC countries, South Africa, and Brazil. Global trends have also been added in the mobile payment technologies study. Additionally, the report also covers segment-wise comparison matrix, market attractiveness analysis, and market positioning of key players for all regions covered in the scope of study. Comparison matrix includes segment growth matrix, 2016– 2026(%), segment revenue contribution, 2016 - 2026 (%), and segment compounded growth matrix (CAGR %). Market attractiveness identifies and compares market attractiveness of segments based on CAGR and market share index across North America, Europe, Asia Pacific, Middle East & Africa (MEA), and South America. Furthermore, the report includes competition landscape which comprises competition matrix, market positioning of major players in the mobile payment technologies marketbased on their 2017 revenues, and profiles of major players. Competition matrix benchmarks leading players on the basis of their capabilities and potential to grow. Factors including market position, offerings, and R&D focus are attributed to a company’s capabilities. Factors including top line growth, market share, segment growth, infrastructure facilities, and future outlook are attributed to a company’s potential to grow. This section also identifies and includes various recent developments carried out by the leading players of the mobile payment technologies market. Company profiling includes company overview, major business strategies adopted, SWOT analysis, and market revenues between 2016 and 2018. The global players profiled in the global mobile payment technologies marketinclude MasterCard International Inc., Visa, Inc., American Express, Co., Boku, Inc., Fortumo, PayPal, Inc., Bharti Airtel Ltd., Vodafone Ltd., AT & T, Inc., Google, Inc., Apple, Inc., Ant Financial Services Group, Tencent, and Microsoft Corporation.